May vEnkatanAtha who is filled with kainkarya srI (divine wealth of servitorship, knowledge, devotion, etc) and a lion among poets/philosophers and who is famously known as vEdhAnthAchAryar reside in my heart eternally. vEdhAnthAchAryar has compiled a beautiful sthOthra grantham named yathirAja sapthathi on emperumAnAr (jagadhAchArya). In the 15th slOkam, he beautifully brings out the unique position of emperumAnAr in our sath sampradhAyam. Our guru paramparai is explained as a beautiful necklace here. Great personalities decorate their chest with this wonderful necklace. Each AchArya is considered as a rathnam (gem) placed in this necklace. 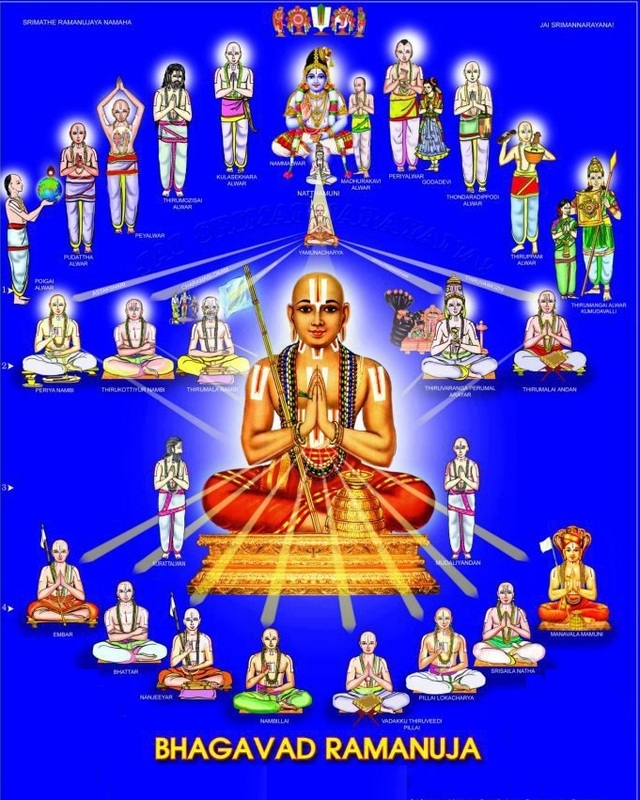 Of these gems, srI rAmAnuja is the most radiant center-piece. His radiance is more shining than the sun's brightness. namperumAL established that our sampradhAyam is called "emperumAnAr dharisanam" in glorification of the very many efforts srI rAmAnuja took to bring the sampradhAyam to great heights. 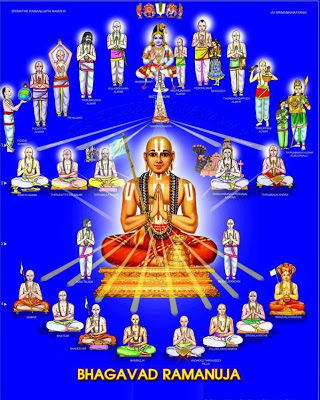 vEdhAnthAchAryar had great devotion towards srI rAmAnuja. He was blessed by nadAdhUr ammAL who is a direct disciple of engaLAzhwAn who was very dear to emperumAnAr and thirukkurugai pirAn piLLAn. vEdhAnthAchAryar has compiled many beautiful samskritham and thamizh literature. Amongst those, kumAra lOkAchArya panchAsath is a beautiful sthOthra grantham in glorification of piLLai lOkAchArya who was the leader of the srIvaishNava sath sampradhAyam and who was residing in srIrangam during the times of vEdhAnthAchAryar. Through his srIvachana bhUshaNa dhivya sAsthram, piLLai lOkAchArya establishes the most important principle of becoming the target of AchAryan's mercy to be uplifted eternally. vEdhAnthAchAryar identifies this principle of AchArya abhimAnam quoting it from srIvachana bhUshaNam in the concluding slOkam of his kumAra lOkAchArya panchAsath. The whole grantham with English meanings can be viewed from http://acharya.org/bk/eb/vyakhyanam/LokacharyaPanchasatVyakhyanaSaram-English.pdf. Today, in srIperumbUthUr we had a wonderful opportunity to witness Adhi kEsava perumAL with ubhaya nAchiyArs, emperumAnAr, piLLai lOkAchAryar and vEdhAnthAchAryar. Today being purattAsi thiruvONam (sravaNam), vEdhAnthAchAryar's grand thirunakshathram celebrations were observed. As it was the final thiruvONam before aippasi thiruvONam (appearance day of piLLai lOkAchAryar), piLLai lOkAchAryar also accompanied vEdhAnthAchAryar for mangaLAsAsanam, thirumanjanam, gOshti and sARRumuRai. 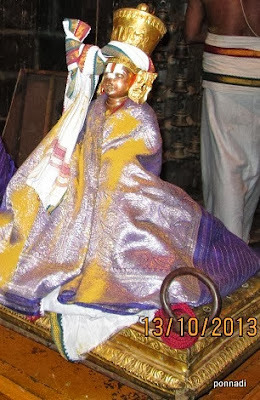 vEdhAnthAchAryar's thirunakshathram is celebrated here in srIperumbUthUr for 10 days with thiruvAimozhi gOshti. On the final day, in the morning piLLai lOkAchAryar arrives to the main sannidhi for mangaLAsAsanam. Both piLLai lOkAchAryar and vEdhAnthAchAryar has gandhappodi (fragrance powder) uthsavam followed by managLAsAsanam to Adhi kEsava perumAL and emperumAnAr with dhAti panchakam and yathirAja vimsathi gOshti. Subsequently, a divine sight of Adhi kEsava perumAL with his nAchiyArs, emperumAnAr, piLLai lOkAchAryar and vEdhAnthAchAryar having thirumanjanam together was observed. Followed by that, thiruppAvai, thiruppallANdu, kaNNinuN chiru thAmbu, thiruvAimozhi 10th centum, rAmAnusa nURRanthAdhi, upadhEsa rathina mAlai and yathirAja vimsathi are recited. Except for thiruppAvai and yathirAja vimsathi, everything else is recited in munnadi/pinnadi kramam. After that a grand sARRumuRai is performed and emperumAnAr's prasAdham of mAlai (garland), parivattam (vasthram and shawl) are presented to vEdhAnthAchAryar with aruLappAdu for vEdhAnthAchAryar. In the evening piLLai lOkAchAryar returns to his sannidhi with dhAti panchakam and yathirAja vimsathi gOshti. Overall, it was a very nice day filled with wonderful events. Let us pray at the lotus feet of vEdhAnthAchAryar to be blessed with devotion towards piLLai lOkAchAryar and emperumAnAr. It was wonderful to have the anubhavam of vEdhAnthAchAryar, piLLai lOkAchAryar and jagadhAchAryar together. Full set of pictures of the events can be viewed at https://plus.google.com/u/0/photos/107723698299182214927/albums/5934261436842467793. Glimpses of vEdhAnthAchAyar's full glories can be viewed at http://acharyar.wordpress.com/2012/09/25/sri-vedanthachariar-vaibhavam/.